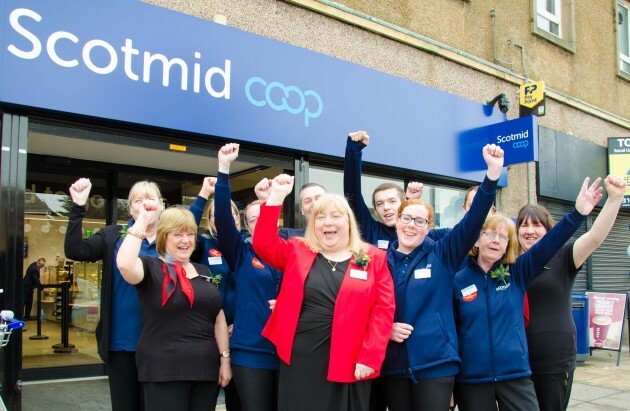 Our Moredun store in Edinburgh relaunched on Friday 6th April with a long queue of customers waiting patiently see their new look store, Big thank you to all our customers who waited. A massive thanks to all the teams who helped with this stores refit. It really does look amazing with our new look fascia!! Big thank you to our birthday girl Rose Spence – Store Manager for cutting the ribbon today. Thank you to our first two customers through the door Ruby and Amy Murray who are regular customers to the store. They are both pleased with the stores transformation. The whole shop has been revamped with more Food to Go available The categories within the store have also been amended to meet demand in the area with new ranges in all sections. The store now has a Rollover (hotdog) machine installed, a Costa machine, Chicago Town Pizza and a slush machine. Still available in store is the bakery counter with a wide range of cakes and savouries available fresh every day. The first 50 customers through the door at 12pm received a goody and a golden ticket. Each golden ticket contained a prize with Nicole being our lucky 40inch smart TV winner and Keir winning the FitBit Alta. Congratulations to them both and thank you for waiting on the day.